Beetroot from the garden ...... now finished............ the last lot were cooked on the 21st. Batteries from car boot sale saving a little. Picked up a whole wheelbarrow full of twigs and bits from the meadow and put them in to dry for kindling wood. House and contents insurance, negotiated to last years price; 6 Month water bill; Food for me and the cat; Diesel for the car and petrol for the mower; Phones and broadband direct debits; Seed Potatoes. Dual membership for small WI; Walking shoes. Bulk online purchase of soda crystals which I use for laundry(better overall than driving to Ipswich and car park charges just for slightly cheaper washing soda at Wilkos). Pipe bender and a handful of tools from workshop to Brother in Law S.
Biggest out was the grey Fiesta..........finally I got organised to use the new car all the time and sold the old one to the local car repair workshop where they want to use it as a cheap-to-run loan car. Some churches are hidden away in villages but Blythburgh Holy Trinity stands huge, high and proud on the edge of the Blyth estuary, just off the A12. It is often called The Cathedral of the marshes . There is so much about this church on the SUFFOLK CHURCHES website and it would be impossible to copy the whole story of the church here. So do go and look if you are interested. Or even better, come to Suffolk and see it for real! People used to think this medieval church was so big because Blythburgh was once a larger village. But Blythburgh has always been a small village and this church was built close to a Priory with plenty of money available at the time given by the pious. The size of the village meant that virtually no restoration was done between the 16C and the 19C. The roof was so bad that people had to take umbrellas and the church was actually ordered to be closed in the 1880s. It has taken a whole century for the church to be slowly restored to how it is today. Enter through the huge porch which has a chapel in the little room above it. This fellow is the reason for this church being featured in the 100 treasures book he is Jack-o-the-clock. Jacks used to ring a bell on the hour and are quite rare, there are just two in Suffolk, the other is not far away at Southwold. Now he is just used at the beginning of services. He is wearing armour from the mid 1500's but may date from later in the 1680's. The roof is amazing and original and somehow escaped having all the angels removed and the stencilling should have also been removed during Puritan times. And then of course I still have the print that we bought for Col's birthday several years ago. It was originally used to advertise the area in train carriages during the 1920s and 30's. Don't forget the link at the beginning of this post to see dozens more photos of the church and lots about the history. I went to have a look on Saturday because on the online catalogue I'd seen an old enamel Flour bin and one or two other interesting things. Also thought my Ipswich cousin might have been there but he wasn't. The flour bin was teeny, not even tall enough for a 1½ kg bag of flour! A nice collection of stoneware. The jugs and jelly moulds were the best pieces. I'd also been interested in this bagatelle board but it wasn't as big as it looked on the catalogue and the nails were all rusty. I reckon this was one of the best things in the sale. A 19th century elm gingerbread mould depicting a bishop or a saint on horseback. I don't know what it went for but I know it was much more than the £20 - £40 estimate because online bidding was higher than that before the sale even started. The other Lots I looked at were a box of country crafts books, might have been able to sell one or two on Ziffit but not the rest and a dolls pram which was completely rusty and the hood all torn. The beginning of the sale had some old enamel signs - and one or two including a Robertsons Golly and an RAC sign went for several £100 each - I know they are popular collectors items but can't see the attraction myself. I decided not to hang around to see what other things sold for because it was absolutely freezing in the big auction building, while outside the sun was shining gloriously. So home for more gardening. Their next Rural bygones sale is in July - I might go and look......I might not. That bargain fruit plant offer arrived, luckily it came last Friday midday giving me all of the lovely sunny afternoon to sort everything out. The 12 strawberry plants were planted into pots, given a good watering and left in the greenhouse. 3 Gooseberry bushes and 6 raspberry canes were stood in water for an hour before planting out and cutting back. The 2 blueberries I left in the pots they were in as they were very wet and had almost no root system. Several £s worth of seeds but mostly things I don't want. So they will go in the car boot box. 200g of fruit fertilizer will be used on the new raspberry bed. 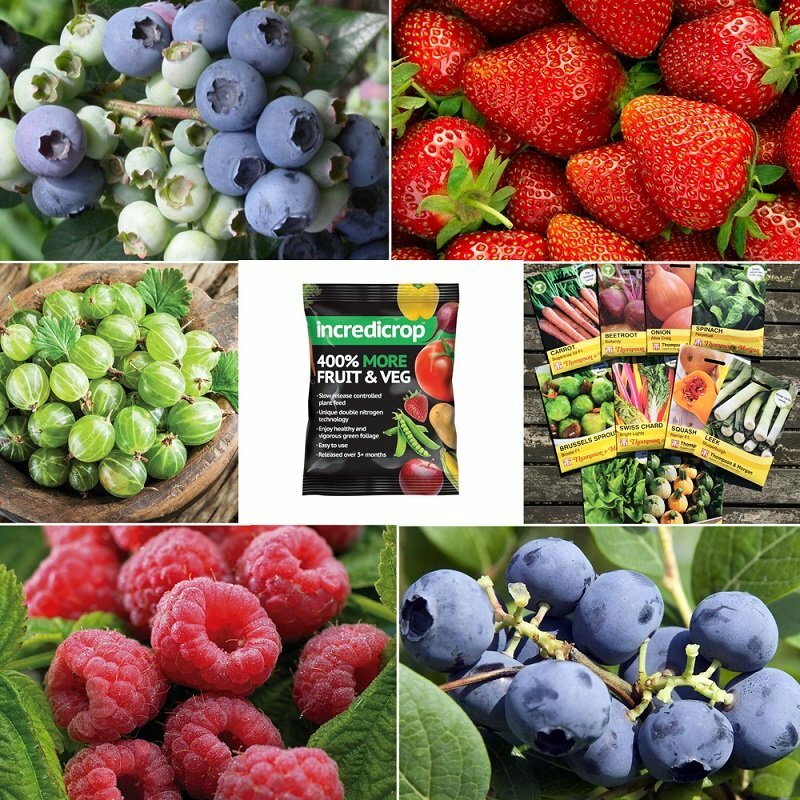 Even without the seeds I think still a good value purchase, although it might be a year or two before I harvest the amount of fruit shown in the ad! The weather continued to be sunny on Saturday and Sunday but still chilly. People who have been able to sit out for coffee or lunch are very lucky! and must have very sheltered gardens although it is often colder in East Anglia in the spring because we stick out into the cold North Sea. I got some more grass cut Saturday with the small mower as well as going out - which is for tomorrows post and in the afternoon there were two rugby matches on TV which I watched while writing posts and loading photos. Spent ages on Sunday trying to find a photo of the inside of the greenhouse on the blog to see what pots were used where last summer. Reason being because I started sorting the greenhouse, just putting the big pots in place with the trays they will stand in, for cucumbers,tomatoes, aubergines and peppers. But I ran out of big pots before I ran out of space - very odd - what pots did I use? where are they now? No idea as I couldn't find a clear photo anywhere on the blog. What I did find was this list made last August, after just 3 months alone and puzzling how I would get through the winter. Well, I got through the winter OK so added some ticks to all the ones that have been done. ...Feels like success! I had completely forgotten about that list so it was good to find it. ............better than the winter month of January............... because it seems to go quickly. Is it because it's exactly 4 weeks? Whatever the reason here we are with less than a week to the end of the month already. I've been tired this week and that's without swimming (half term makes the 1 hour over 50's session really busy as the pool is used for scuba and canoeing lessons at other normal swimming times). Sometimes having to do all the thinking and organising that used to be done by two people is hard work and I do so much more driving than in the old days and have always found it tiring and even though I've cut my charity shop stint down to 3½ hours I still came home exhausted...... and it's not even proper work! So it was good to have Thursday and Friday without taking the car out of the garage. Seeds have been sown and popped in the electric propagator .........aubergine and peppers which both need a long growing season, then parsley and basil. Hanging fire a bit for tomatoes and cucumbers. Compost has been spread onto the bit where I'm putting potatoes. Must work out where everything else is going. Colin always seemed to remember what he had put where but once a bed is cleared I haven't the foggiest. Bed 5 is the permanent fruit bed - raspberries, 1 blackcurrant, gooseberries with the new asparagus bed at the hedge end. Plans for growing this year include all the above (although fewer potatoes) PLUS Butternut squash and the mini sweetcorn and I'm determined to grow some chard and actually manage to keep it protected from the pheasants and ducks. Grass dry enough to cut with the ride-on mower. Finally organising the selling of the second car. Have a lovely weekend whatever your plans. If I go and collect my prescription meds from the pharmacy at my doctors in a nearby village on the right day at the right time, I can treat myself. Because twice a week the fish and chip shop in the same village does a cheap Pensioners lunch for £3.50. It's probably a good thing that I only pick up tablets once a month! Plaice and chips last week. Thanks for comments over the last few days especially the ones found late, sorry I've not had a chance to reply. Apart from it's mention in the 100 treasures book this church has a claim to fame as being the church featured in AKENFIELD, the 1974 film made by Sir Peter Hall and based on the book by Ronald Blythe. This church is all about the roof, the carvings and the angels, but being right up high 'twas a bit difficult to photograph. The book says that with binoculars you can see an albatross,a fox with a goose in its mouth, an owl and a terrier. Apologies for my dreadful photos, trying and failing to hold the camera steady pointing up in the air. View down the nave. This church is cross shaped and has two projecting 'arms' known as transepts. The speaker at Big WI for February was Bob Harding Jones who had come all the way from Hertfordshire (although he once lived in Suffolk) and is a retired farmer. His subject was "Funny Stories from a speaker". He had a folder full of notes gleaned from his years travelling round to speak to WI's and other groups. One said " there is very little parking so please drive slowly passed the hall and someone will be there to show you where to park. If there is no one waiting drive round again and slow down as if you were looking for someone to pick up!" Another " A chair will mark your parking space, but please move the chair before parking!" He had lots of other tales like this and old country stories and also read bits from Sheila Stewart's book "Lifting the Latch" and some of his poems. Coffee and Cakes of course. It was a bit misty in places on my drive there so I was pleased to find that it hadn't turned foggy when I drove home....hate fog in the dark. This week the meeting was a speaker from Suffolk Prickles Hedgehog Rescue. They are a voluntary self funded organisation. She told us all about how the rescue centre had started, taking in just a few sick, injured or underweight hedgehogs until up to date when they can have up to 200 hedgehogs being cared for in two centres. The reason for the increase in calls for help to the charity seems to be warmer winters which has stopped hedgehogs "Hibernating" ( strictly speaking they don't hibernate) but then there isn't enough food for them. Warmer winters and wetter summers has also increased problems with internal parasites like Fluke worms. From being one of the most common creatures their numbers have dropped to critical. The decrease in towns and villages may be because gardens are too tidy and fenced so the hogs can't range, they like a big area to move round for food and to make daytime nests. In the countryside it has been the large fields without hedges that have seen numbers decrease. She explained how they care for the hogs and try and release them back where they have come from once they've been treated and put on weight. We had a bring and buy sale to raise a little extra money for the charity as well as their fee. Coffee and cakes again. I've put my name down for the Suffolk East Federation Spring Quiz in March which will be fun. Printer cartridges - Epson with a cheetah picture - vain hope! There is something else but I can't think what at the moment! Christmas cards and craft stuff. There were lots of car boots with tons of stuff, many big vans with boxes full of house clearance rubbish and it looked hopeful. But............................no real treasure...... however I did tick wooden puzzles off the list. The small batteries fit the doorbell and I've been carrying an old one around for ages trying to remember to find some new spares = £1. The puzzles for Willow, one 50p and the other £1.50, book 50p (I've picked up Margery Allingham books before and then resold on Ziffit and this one is worth 79p to them at the moment, so I shall read and sell, a 29p profit is not to be sniffed at!) The chocolates? - they are my Brexit store! = 50p each with 5 mini things in each pack. Thank you for all the Magpie comments yesterday. Amazing that two people saw eightand boys were born. Don't think I've seen more than 3 or 4 at once, usually two. Magpies flying three or four together and uttering harsh cries predict windy weather. For anglers in spring it is always unlucky to see single magpies; but two may always be regarded as a favourable omen. The reason is, that in cold and stormy spring weather one magpie alone leaves the nest in search of food, the other remaining sitting with eggs or the young ones; but two go out together only when the weather is mild and warm, which is favourable for fishing. Growing up in the country there is one thing I do know about magpies.......... they are pests, taking the eggs and even the chicks of other birds. There are certainly more around now than in the past and it's rare to drive out anywhere in the country without seeing one or more. Here we are heading into the second half of February and I came out of hibernation on the 11th. It's always a worry in November, December and January because I begin to wonder if my gardening mojo has gone forever but there will be a day when the sun comes out, the wind drops and it's dry underfoot and I find that the pull of the hoe gets me outside. I started with the cutting garden and then found lots of brambles growing over one of the shrubs so the secateurs came out too. After an hour several odd jobs were done and that was enough for one day. Another hour on Wednesday and the Hollyhocks were planted out and a small bed weeded. On Thursday the raspberry and strawberry beds were weeded and I started cutting back last years dead stuff from the flower garden.Yesterday I cleared the big soft fruit bed of weeds and finished cutting back the dead stuff in the quarter circle. I really have to take care of my back early in the season but just an hour at a time makes a difference . Got lots of tidying done in the garage too which felt good. Another month and another heap of books collected from the library van, all books I've requested. From the bottom of the pile...........first Jack Monroes latest cookery book. Then four other non-fiction to read or just browse. I asked the library about getting some of the Dean Street Press Furrowed Middlebrow reprints. Lots more have been published this year but they just ordered 2 by D.E.Stevenson- which I shall be grateful for as I can't afford to buy them. There is another British Library Crime Classic reprint and also another George Bellairs has also been reprinted from the 1960's.Top of the pile is by Chris Nickson, the second in a series about one of the first WPCs. A big pile of books went back to the library van and the ones I've read during the last four weeks have been added to the separate page and of course a whole post about Tombland. A few from last time went back unread for various reasons.........one had tiny print, one was from earlier in a series............... I'd read a later one and decided not to go back to the beginning to read. I've still got the 3 in 1 book by Ngaio Marsh, must read it as it's been renewed a couple of times already. I don't add factual books like cookery books to my books read page but the Creative Kitchen was an interesting sounding book, and has some lovely ideas for possible presents. The photo-copier bit of my printer has packed up so I'll take this into the library and photo copy some pages to keep. Have a lovely weekend whatever you are doing. I spotted signs for another Jumble Sale, so that's my plan. According to a list in the free magazine (Ipswich 24) I picked up recently these are THE things that people will be buying this year.....they are the new super-foods! 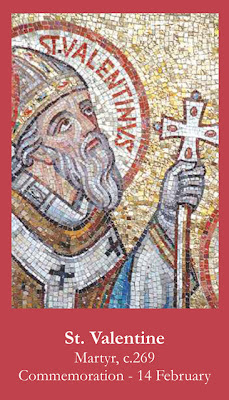 There was probably more than one St Valentine, but one of them was a 3C martyr and not much is known about him but there is an undisputed history of people celebrating on this day going back 600 years. Chaucer wrote, sometime between 1376 and 1382, a poem telling how birds choose their mates on St Valentines Day each year and this day was supposed to be the first day of spring in many places. Later the link was made to people choosing a mate on this day too but no real connection with St Valentine. Valentine cards appeared in the 19C and were elaborate or romantic, comic or rude. Rude ones sent as a joke among the working classes were the cause of the celebration of this day going out of fashion through Victorian times, coming back into popular fashion in the second half of the 20th century. Now the cards are in the shops just after Christmas and everything is sold, from teddies to cakes, with a heart featuring on it and every shop has a Valentine window and florists charge a fortune for roses (cynical ........ moi?). PS. Thank you to all new followers, what a nice surprise. Found a recipe to use up some of the jars of home made marmalade that have been stored since 2017. I don't eat it often because of eating less bread. Also need to make use of the loaf tin liners that I won at the Bacton Produce show last year. Mix everything else together and tip into prepared 2lb/1kg loaf tin and smooth the top. Bake for 1 - 1¼ hours until a skewer comes out clean......... cover the top with foil for the last 15 minutes. Warm the remaining marmalade in a microwave or on the hob until its soft then brush over the cake while it's still hot. This might be a good cake to make when I have to take cakes to WI. Many thanks for comments about Thornham Parva church. It's not far from home yet on a road that I would never have used so wouldn't have found it except for this blog. It was such a welcoming little church and the movement sensor lights are an easy idea that other churches could copy. Welcome to another person clicking the follower button, I'm hoping for 500 by the end of the year! This Norman church is small but perfectly formed. It is a thatched church in a tiny parish to the north of the Thornham Estate, home of Lord Henniker. The other side of Thornham estate is Thornham Magna which has it's own church. Stepping inside, unusually there is no porch, on a cold snowy day in January and lights came on automatically, what a good idea. Behind the altar is a painted oak panel or retable dating all the way back over six and a half centuries to the 1330s.It is part of a work that was probably originally made for the Dominican Priory in Thetford. It was lost for decades until an ancestor of Lord Henniker bought it at the sale of a farm in Stradbrooke in 1778 it was then forgotten again and found in a stable loft at Thornham Hall in 1927 when it was given to the church. It was during restoration in 1998 that the age of the panel was confirmed. There is another part of this panel in the Musee de Cluny. These show the early years of Christ and the Martyrdom of King Edmund..
Not many years beyond 60 and proud of being Suffolk born and bred! After 38 years of happy marriage .....with 23 of those years spent on a self-sufficient smallholding....my dear husband Colin died in May 2018. Our 3 grown up children have given me 3 wonderful grandchildren......so far. I live in a cottage at the end of a lane in Mid Suffolk and hope to stay here in the peace and quiet until I get too decrepit to drive! My Life in the country. Bee Swarm in our bedroom . . .